With fond memories of his childhood on the neighborhood farm in Nebraska, Dale Nichols continued to be influenced by his affection for his native Midwest. "Farm life was all I knew for the first 20 years of my life. In painting these canvases, I felt again the vastness of endless skies, experienced again the penetrating cold of Nebraska winters, lived again as farmers live …in spirit, I am very much a farmer," Nichols has said. Educated at the Art Institute of Chicago, Nichols became the first Carnegie visiting professor of art at the University of Illinois. 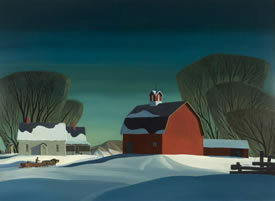 Admired for his gentle attention to detail and loving portrayals of rural life, Nichols' work was selected for exhibition at the Century of Progress in Chicago as well as five World's Fairs. His work can be found in numerous public and private collections throughout the country as well as the Metropolitan Museum of Art in New York.